Snow Orchid’s strong oxidation and roasting make it one of the bolder examples of Da Cong wulong in our catalog. Historically, four regions in China were the first to produce wulong tea. These regions were the Wuyi Mountains in north Fujian Province, Anxi City in the center of Fujian Province, Taiwan island across the ocean from Fujian, and in Chaozhou City near the coast between Fujian and Guangdong Provinces. Nowadays there are many tea regions that produce wulong tea, but these four regions were the first. Chaozhou City is famous for producing Dan Cong wulong tea. The climate of ChaoZhou City is tropical and subtropical, and the soil is a rich yellow/red color. In tea records, historians talk about Phoenix Mountain tea region in Chaozhou city where they began growing tea 600 years ago. The legend of Phoenix Mountain comes from the end of the Song Dynasty. In this legend, a young Song Dynasty emperor and his officers were being chased by Mongolians attacking from the north. They were forced to travel for a long time and pass by this mountain range. The emperor was very thirsty, but had no water to drink. A phoenix flew over the emperor and dropped tea leaves and seeds in his hands. His servant instructed him to chew the leaves to stop his dehydration. The emperor ate the leaves and was refreshed. Believing that the eat leaves were a treasure from the gods sent by a legendary phoenix bird, they decided to name the region Phoenix Mountain in honor of the story involving this legendary bird. The Phoenix tea region is very large, and the highest peak is Wu Dong Mountain which is rumored to have been where its tea history began. There are still over 4,000 tea bushes here that are over 100 years old. The oldest bush is the mother bush of Huang Zhi Xiang (Yellow Sprig). It stands 6 meters tall and is about 600 years old. The farmers traditionally grew tea by seeds, but like apples, seeds will produce different types of bushes. There are so many different types of tea bushes in Wu Dong Mountain, many older than 100 years old. They have center roots like tea trees, so the Chinese call them half tree tea bushes. These bushes share similarities with the character of tea trees in that they have a robust and concentrated quality. Tea drinkers describe dan cong wulongs from Guangdong Province as possessing ten different aromas. Snow Orchid is the most popular on on the market because of the rich, orchid aroma and robust flavor. The strong flavor comes from using young bushes averaging around 25 years of age in order to make this tea. Southern China is warmer, so tea is picked earlier here, around early April. They pick the top 3-4 leaves of the new growth branches. The fresh leaves are carried back to the factory to wither under the sunshine for 1-2 hours. After that, they are sent inside the factory and placed inside a large rolling machine. Good quality rolling machines are made of woven bamboo, all run by an electric motor. Lots of people use stainless steel machines, but our tea is made using a bamboo one. They will gently rotate the leaves a few time over about 2 hours to help them keep withering. They will raise the temperature of the machine to help the oxidation process and shake it more often over the course of 4-6 hours. The tea master will then take the leaves and use a very hot (above 200 degrees celsius) and quickly fry the tea leaves for about 10 minutes to kill the enzymes and stop the oxidation process. After the tea is fried, the leaves are soft and can be twisted into their shape. A kneading machine is use to compress and knead the leaves until they are twisted in to their long shape. The leaves will be wet and moist, so they are dried in an oven for about 40 minutes. The mao cha is now finished. 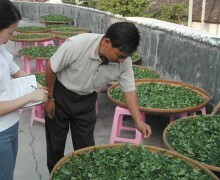 They will pack all the mao cha in large bags and wait until the season is over to sort out the sprigs and unfolded leaves. The tea will be roasted one more time and will then be done. Snow Orchid is the most popular Dan Cong tea. The strong oxidation and roasting allow the special character of this tea to remain stable for at least two years. Appreciate the dry leaves that smell like the local orchids blooming in winter from which this tea is named. After brewing, the clean honey tea color will yield a robust flavor that fill the mouth and leaves a complex lingering aftertaste. The Chaozhou people, from whom this tea comes, are famous for their rich diet and frequently pair this tea with meals to improve digestion. They will always use about 8 grams or more of tea per serving, but will only brew each infusion for about 1 minute. Note: This tea was formerly named Xue Lan Xiang. Dan Cong wulong leaves are lightly withered under the sun in the afternoon for a couple of hours before being sent inside for natural oxidation. 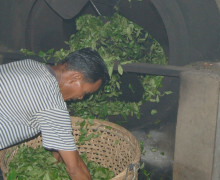 The natural oxidation process includes putting the tea in a wood rolling machine. This hot rolling machine will stop the oxidation by frying the leaves inside for about seven minutes. The yellow, untwisted teas and stems are ground up and sold to tea companies who make tea bags. Dan Cong Wulong is traditionally wrapped in rectangle shaped packages. Local Chaozhou people will put in more than 8 grams of Dan Cong wulong for each serving. They will only infuse the tea for a minute at a time. Traditional Chaozhou tea service only uses three cups, no matter how many people are there. The cups are rinsed with boiling water before each serving of tea. Infusion: First infusion at least 1 minute. The leaves are good for 8 infusions.